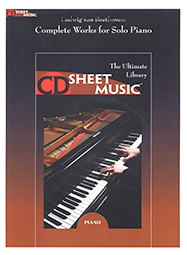 This CD contains sheet music for every keyboard Sonata by baroque composers Haydn (all 52) and Scarlatti (all 550) over 2500 pages of music. Franz Joseph Haydn was born in Rohrau in 1732 and died in Vienna in 1809. Alessandro Scarlatti was born in Palermo in 1660 and died in Naples in 1725.